The year of 2018 has represented a period of enforced inactivity and injury frustration for the former WBO world middleweight champion, who relinquished the belt following the failure of the Massachusetts Commission to issue him a licence for his mandatory defence against Demetrius Andrade in Boston back in October. 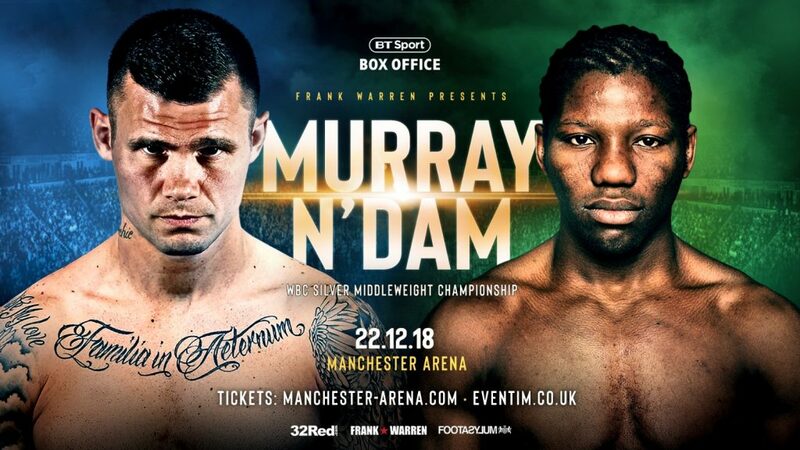 Two scheduled defences against Martin Murray were both aborted due to injuries suffered by the champion, resulting in Saunders not building on the momentum of a hugely positive and busy end to 2017. His last fight and perhaps his career-best performance to date came nearly a year ago when he travelled to Canada to put his title on the line against the big-hitting David Lemieux. The Canadian was hardly given a look-in against Saunders at his slickest and a shutout scoreline was recorded on the card of one judge. Three months previously at the Copper Box, the Hatfield man – who trains in Sheffield under Dominic Ingle – widely outpointed Willie Monroe jr, who is set to fight Jermall Charlo for the WBC Interim world middleweight title on the same night as Saunders’ own return. There is a strong middleweight theme running through the Manchester card, with a barnstorming clash scheduled between Mark Heffron and Liam Williams for the vacant British title, while Martin Murray, who is bidding to put himself firmly in the world title picture, takes on a tough assignment against Hassan N’Dam. Now Saunders is added to the mix, where he will take on the experienced Hungarian Zoltan Sera in a bid to extend his perfect professional record of 26-0. Sera, 33, who has fought at light heavyweight in his last two fights, has recorded 22KOs from his 32 wins. Despite his hopes of making a lucrative defence in Boston being dashed, Saunders has remained in training and will be looking to reclaim his world title property in 2019 after sharpening his highly-skilled tools against Sera in Manchester. JAMIE MOORE says that Josh Warrington will struggle to replicate his stunning performance when he took Lee Selby’s IBF World Featherweight title in May.Warrington (27-0) upset the Welshman and he is now the underdog again ahead of his first defence against Frampton (26-1) on Saturday December 22, live on BT Sport Box Office. Frampton’s trainer Moore believes that was a once in a lifetime performance from Warrington in front of 25,000 fans at Elland Road, home of his beloved Leeds United. “I think Lee Selby was probably his big night – I’ve got to be honest,” said Moore. “Was Lee dead at the weight? No. Absolutely not, because he wouldn’t have made it through 12 rounds. I’ve been there. I know what it’s like. “Was he tight at the weight? Yes. But, a lot of fighters are tight at the weight. I don’t think you can take away from Josh’s performance by saying Lee was dead at the weight. “I think Josh raised his game. That was the night he looked for in the whole of his boxing life. From being a kid he would have wanted to win a world title and hopefully had it at Elland Road. “Josh brings pace and work rate so we know Carl has to be on his game physically and he is on track. “His jab, his judgement of range and distance. You can’t just go in there and out work someone who has got the skill set of Carl. “It takes a lot more than that. You have to set those sort of things up and Carl is very good at stopping an opponent in their tracks or anticipating what they’re gonna do. “His feet are nice. He has got an unorthodox defence so he’s not a typical hands up, fast feet boxer. He dips, rolls and slides and has an odd rhythm. “Even though I know it will be competitive in fights like this where the styles are going to gel well, the better fighter with the skill set usually wins. “Josh will be surprised how hard Carl hits. Since Carl moved up to featherweight people think he is not a puncher, but going in with the opponents he has been in with you can understand why he goes the distance. “I am not giving away clues for the game plan, but I wouldn’t be surprised if Carl gets him out of there. “It won’t be early because I think Josh has got a good set of whiskers, but I think it will be a case of breaking him down slowly and later on Carl will get to him. Mark Heffron and Liam Williams contest the vacant British middleweight title and Belfast’s blue chip featherweight prospect Michael Conlan (9-0) takes on former commonwealth champion Jason Cunningham (24-5). 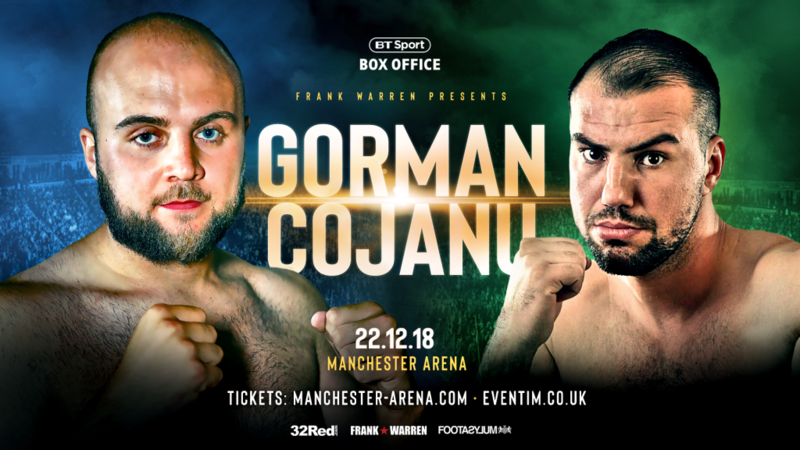 In a step up, Nathan Gorman puts his undefeated record and WBC International Silver Heavyweight Title on the line against former World Title challenger Alex Leapai, while Martin Murray defends his WBC Silver middleweight title against Hassan N’Dam. Tyson Fury’s younger brother Tommy Fury also makes his professional debut. 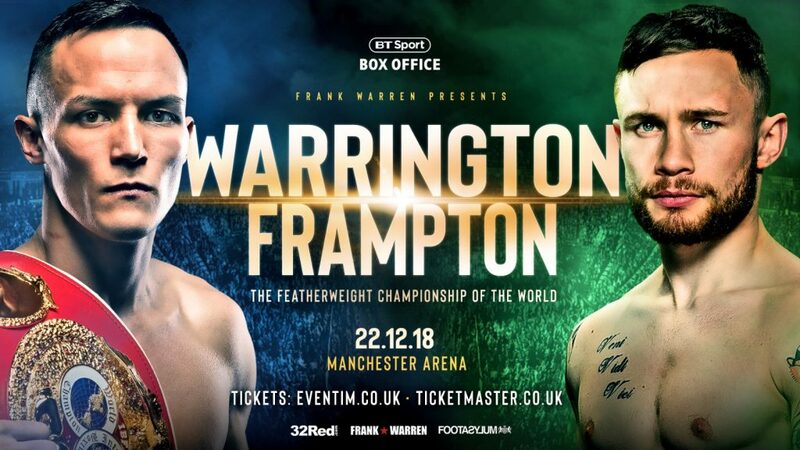 Josh Warrington believes boxers have an obligation to boxing fans to make the right fights at the right time, which is why he is readying himself to take on Carl Frampton at the Manchester Arena on December 22. The Leeds Warrior points out that some fights have been left in the file marked ‘pending’ for too long and can lose their appeal as a result of the delay. There is no danger of Warrington falling into that trap, what with signing up to face two-weight world champion Frampton for a first defence of IBF world featherweight title he won in May from Lee Selby. “Even when the fight was first talked about a couple of my pals said I should just have a steady defence,” recalled the unbeaten Warrington, who swiftly rejected the suggestion. “The way I responded was to say there isn’t an easy defence at world level and if you think there is you are maybe taking your eye off the ball. “Secondly, I want these fights to happen because I want to prove I am the best and I want to be No.1 – I am ranked No.2 behind Carl and I want to be first because this is my year. “Frank (Warren) said this fight should happen this year, but we weren’t under pressure to do so. The fight could’ve happened next year in a big stadium showdown, but there is the risk of a fighter getting injured and prolonging that or the dates not matching, or a fighter getting beaten. “We are at a high level and one punch can change a fight, so get the fights going now because it is what the boxing public want to see. “That is why the sport it booming again because fights are getting made that people want to see. When fighters dig their heels in, like Kell Brook and Amir Khan, a fight loses its gloss. “A few years ago that would have been exciting, but not so much now. People might still want to see it, but is it going to be the same fight? “Manny Pacquiao and Floyd Mayweather boxed a few years too late, but we are both in our prime now, so why not get the fight happening and we are doing so now. 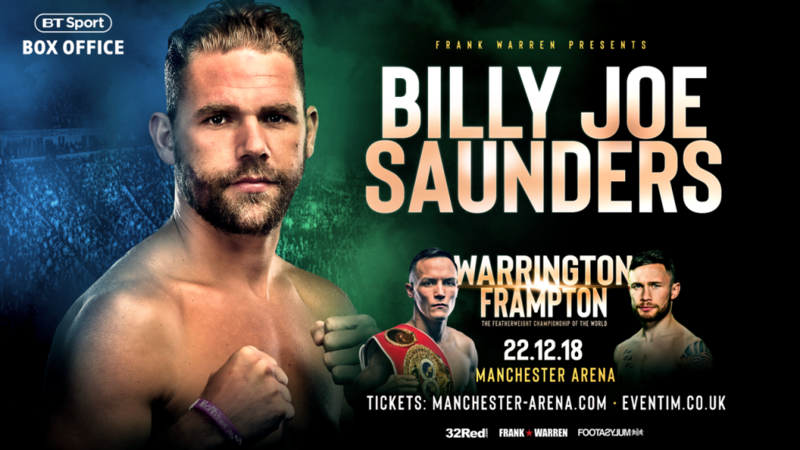 Tickets are priced at £50 Upper Tier, £80 Tier, £100 Tier, £150 Tier, £200 Floor/Tier, £300 Floor, £400 Floor, £600 Inner Ring VIP Hospitality and are available.Tickets available via Manchester Arena. 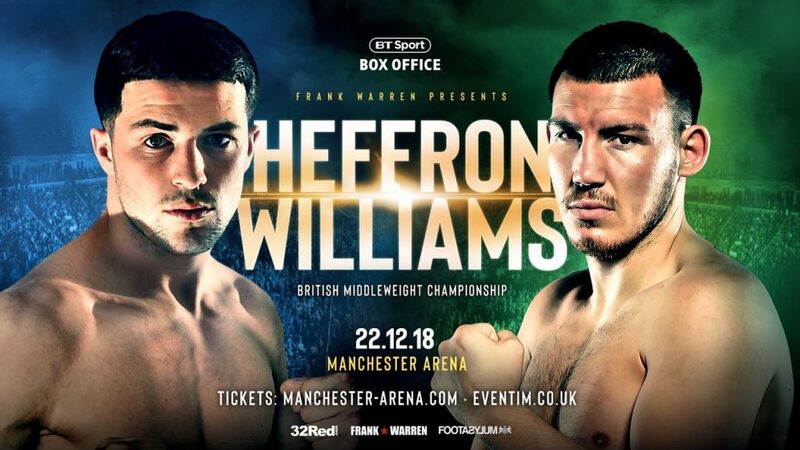 MARK HEFFRON HAS locked horns in training with an informative ally as he prepares to challenge for the vacant British middleweight title against Liam Williams at the Manchester Arena on December 22. Heffron, 21-0, last week received the welcome news that he would still be competing for the coveted Lonsdale belt against Williams, who is jumping up to 160lbs for a fight that has caused a big stir in the boxing fraternity and one of many that could potentially steal the show on the epic Josh Warrington-Carl Frampton card, live on BT Box Office. The knockout artist from Oldham – also known as ‘Kid Dynamite’ – is now in possession of some useful inside knowledge on the workings of his opponent, otherwise known as ‘The Machine’. Because, he shared a ring on Monday with none other than Williams’ nemesis Liam Smith, who has experienced two ultimately successful encounters with the Welshman. “It was good, man, and I got a good solid eight rounds in with Liam where my fitness was mint,” reported the 27-year-old. “I would say I am ahead of where I thought I would be at this point. “Yeah he has been telling me loads of things, Liam, just loads. I’ve been taking it all in when he is telling me what Liam Williams is good and bad at. “I won’t say what, but I have picked up loads of little things myself from watching him too. So with Liam Smith telling me lots of points too I would say everything is going to plan up to now. “I am looking forward to it,” added the WBC International title holder, who is happy that the British title remains on the line for a fight he considers to be of far greater magnitude than the one he was originally mandated for. “I’m buzzing, Liam Williams is a big light middleweight anyway and it is a big name for me when I beat him. “I am still getting to fight for the British and at this level I will beat them all. “I am even more happy that it is against Liam because he is a massive name for me, much more so than Jason Welborn, and he will bring the best out in me. IBF world featherweight champion Josh Warrington takes on former two-weight world champion Carl Frampton at the Manchester Arena on December 22nd live on BT Sport Box Office. Mark Heffron and Liam Williams contest the vacant British middleweight title and Belfast’s blue chip featherweight prospect Michael Conlan (9-0) takes on former commonwealth champion Jason Cunningham (24-5). 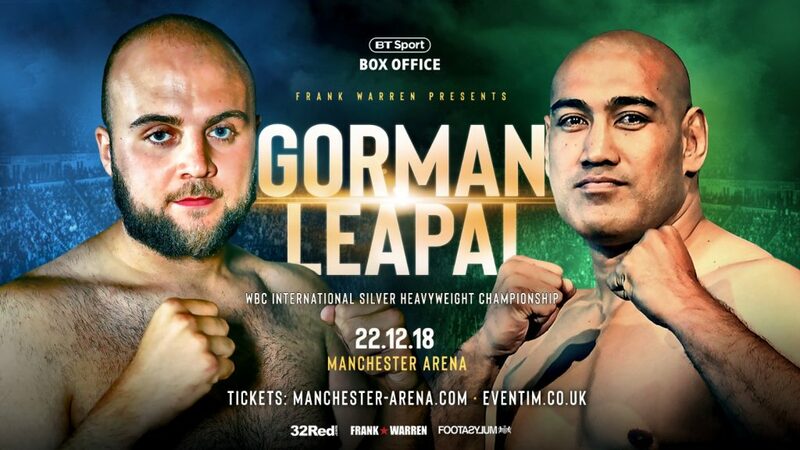 At heavyweight, Nathan Gorman takes a step up in class against former world title challenger Alex Leapai. Elsewhere on the bill, world flyweight title challenger Paddy Barnes (5-1) and unbeaten Light Heavyweight contender Steven Ward (9-0) return to action. Manchester’s 12-0 Light Heavyweight Lyndon Arthur and 7-0 Darlington middleweight Troy Williamson also feature.